American football has seen exponential growth in the last two decades. High flying offense, easy television translation, and heavy fan integration has made this complex and physical game the most popular sport in the continental United States. Mirroring the growth of professional football has been the John Madden Football franchise, simply known as Madden (insert year here). Fans of the football franchise are often lifers, people who have been with the franchise for at least a decade. The series has seen iterations from the Sega Genesis to its current cross platform state and has been a priority launch game since the PlayStation 2. Being the 25th anniversary of the annual franchise, EA Sports took the occasion to name this year’s football simulation not for its year, but rather after its place in the deep roster of Madden titles. This self-proclaimed celebration gives Madden 25 a chance to pay respect to its many previous entries over the last quarter of a century, with loading screens that recall features added to each iteration. 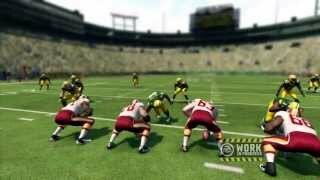 It gives Madden 25 a somewhat nostalgic feeling, reminiscing about the first time the games featured instant replay, motion capture, or when it got rid of passing windows. It also gives a nod to some of the past failures like QB vision and auto-adjusted difficulty. However, the most depressing thing about these little nods to the past is the realization about how little has dynamically changed in the last decade of the franchise. There are many camps of Madden fans, but it is safe to presume that each year we all fall into one of two; you’re either excited for this year’s game, or you’re not. Since 2004, the Madden franchise has failed to make any revolutionary changes to their game and this year remains the same in a lot of ways. Much like years where the truck/hit stick was introduced, or when the animations were overhauled, this year’s Madden continues to shave off degrees of imperfections, getting a product that is ever-so-slightly improved but still feels far from the product we really want. The new Infinity engine looks nice, especially during replays and cut-scenes, but the animations are still repetitive and quickly becomes old. Madden’s failure at immersion continues through its on-field gameplay. Constantly attempting to tow a line between compressing the three-hour real NFL game time and still simulating real NFL stats, Madden has always come close to achieving this without really hitting home. This year’s iteration is no exception. Defenses still feel slightly overpowered and stopping top rated quarterbacks like Aaron Rodgers, Tom Brady, and Peyton Manning feels a little bit too easy. Running conservative coverage schemes causes these elite passers to constantly check down, making them slowly chip away at your defense. While it is a decent take on actual strategy, it also means that these elite quarterbacks are easily contained to 200 yards passing and--at most--a couple touchdowns. Meanwhile, on the offensive side of the ball, the quarterback position is largely dependent on player skill. Rodgers and Brady might be more accurate and powerful with their arm, but in the NFL the real divide between the elite and pedestrian is awareness and intelligence. In Madden it’s as easy to find the open receiver with Peyton Manning as it is with Ryan Tannehill. It allows players to compromise at what is often thought to be the most important position in football. The biggest head-scratcher in Madden’s simulation mistakes is the frequency of injuries. In one game both me and my opponent lost our starting quarterback; I also lost my starting running back and a linebacker, all for multi-week injuries. This added to two defensive linemen and a tight end injured for multiple weeks, all after the first game of the season. It is strange enough that the simulation AI doesn’t protect your starters in the preseason, but losing so many players before the second week of the season seemed bizarre. Even after turning the injury slider down from 50 to 25 I still saw approximately two guys go down on my team each week, one with a serious injury. After adjusting the slider to 10, I was able to stop the slaughter. It is unfair to harp on these shortcomings without pointing out what Madden does really well. The running game remains tons of fun as shaking linebackers with Doug Martin and running over them with Adrian Peterson is exhilarating. Madden is able to capture the feeling, whether at your own 20 yard line or in the red zone, you are just one play away from pay dirt. Those real life feelings where your defense is crumbling against a last second drive, or when your offense is desperately running a two-minute drill is still alive and well in this football simulator. Madden fails and succeeds in very much the same way it always has, one minute it has your heart in your throat and you’re wiping your sweaty palms on your pant leg, then a couple minutes later you’re slouched on your couch trudging through another uninteresting game in your season. The hot/cold fun streaks in Madden are also represented in the game’s difficulty. While on the preset Pro difficulty I dominated the competition, running up scores on offense like the Greatest Show on Turf, then dominated on defense like the Steel Curtain. After bumping the difficulty up to All-Pro, every game became a desperate struggle, squeaking out points while praying my defense would bend but not break. Finding an appropriate difficulty in Madden feels like rocket science, as you constantly adjust the game’s sliders up and down then flip between difficulties to find something that feels challenging while not making you feel like the AI is out to screw you. "Love it or hate it, after 25 years, Madden fans know exactly what they are going to get"
Madden NFL 25 is ranked #498 out of 1434 total reviewed games. It is ranked #49 out of 158 games reviewed in 2013.